See great art on the Eastern Shore of Maryland. Plein Air Easton is coming this July! The Plein Air–Easton! Competition & Arts Festival celebrates its eighth anniversary by continuing the vibrant dynamic that has made it the nation’s premier plein air festival and one of Easton’s main attractions. Plein Air–Easton! is at the forefront of the modern plein air movement. Artists, collectors, and art lovers alike have discovered that this event lives up to its motto of “Art for Everyone” by producing some of the best representational artwork in the country, along with events that appeal to a wide variety of art enthusiasts. Most events are free and open to the public. With hundreds of artists and a wealth of artwork to choose from, this weeklong artfest is one of the country’s hottest art sales of the year, offering the art collector a unique opportunity to select from a huge inventory of reasonably priced paintings. FESTIVAL HIGHLIGHTS . . .
· Opening Dinner & Paint-Out, Saturday, July 14 at 7pm. A brand new opening event presented as a benefit to members of the Friends of Plein Air–Easton!. The Friends of Plein Air–Easton! Opening Dinner & Paint-Out takes place Saturday, July 14 (Bastille Day) on the Normandie estate located on the Tred Avon River. The property boasts beautiful water views, striking architecture, lovely gardens, and an impressive world-class classic car collection. The Opening Dinner & Paint Out will offer guests the opportunity to meet this year’s 58 competitors—some of the most renowned artists in the world of plein air painting—as they arrive, register, and begin painting in the weeklong painting marathon. Guests will enjoy a lavish French dinner, live music, and the company of artists and fellow art lovers. The evening will end with an exhibit and sale of the works created that day. This event is sponsored by the Chesapeake Bay Foundation. Collectors’ Preview Party, July 20 at 7pm. Offers the first chance to view and purchase competition paintings. More than $20,000 in prizes will be awarded. The full $150 ticket price may be applied to any Plein Air–Easton! art purchase at the Academy Art Museum on July 20, 21, and 22. Plein Air–Easton! Competition Gallery Exhibit & Sale, July 21 and 22. As paintings sell, replacements will take their places, so that this exciting exhibit evolves throughout the weekend. Stop by several times to see and purchase new artwork. Free and open to the public. National Quick Draw, Exhibit and Sale, Saturday, July 21, 10am-2pm. Long on excitement, short on time, this two‑hour paint-out, followed by an outdoor Exhibit and Sale, is one of Plein Air–Easton!’s most popular events. Spectators and art buyers flock to downtown Easton to watch more than 150 artists paint within a six-block area, creating entire paintings in just two hours. Total cash prizes of almost $3,000. Open to any artist; registration information at www.pleinaireaston.com. Children’s Quick Draw, July 21, 10am-12pm, on the Academy Art Museum lawn, free to young artists, ages 5-12. Supplies and basic instruction provided. Space is limited; pre-registration is recommended. To register call Jeanne Saulsbury at 410.634.2360 or e-mail jsauls@comcast.net. from 2-4pm. Cash prizes totaling more than $3,000 will be awarded. Registration information at www.pleinaireaston.com. · Outstanding Operetta: July 20-22, Avalon Theatre, Wye Operetta Workshop (WOW) returns for a 5th year with a rollicking rendition of Gilbert and Sullivan’s perennially popular operetta, H.M.S. Pinafore. Be awed by this talented cast of students 8th grade thru college. Professionally costumed and staged. Sponsored by the Wye Conservatory of Music. · Strong Support: Friends of Plein Air–Easton! continues to ensure the success of its namesake event while celebrating and preserving local landscapes and strengthening the arts in our community. For information or to become a Friend, call 410.822.7297 or visit www.pleinaireaston.com. The event is sponsored by Friends of Plein Air–Easton!, the Talbot County Arts Council, Maryland Public Television, corporate donors, and media sponsors. For full itinerary, artist information, ticket sales, and more, call 410.822.7297, email info@pleinaireaston.com or visit www.pleinaireaston.com. Plein Air Easton information provided from their press release. 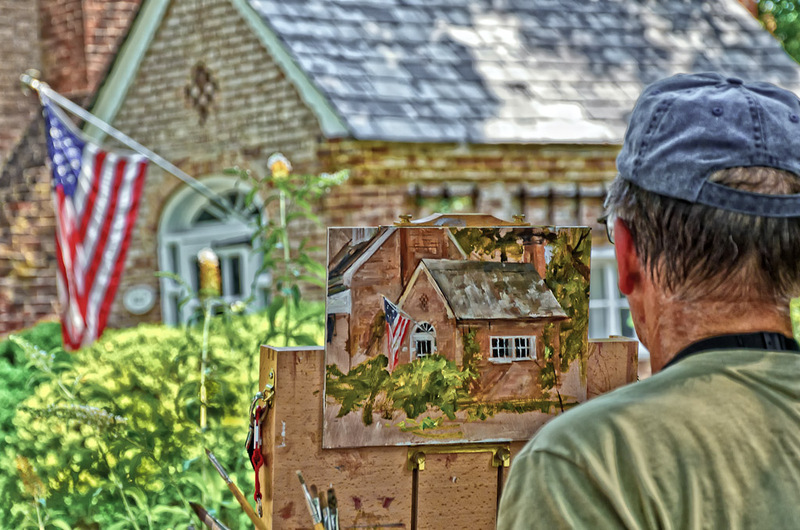 Visit Easton, Maryland for Plein Air art this July.